Started playing around with a different setup - one that would allow me to change up my play environment from my work environment. 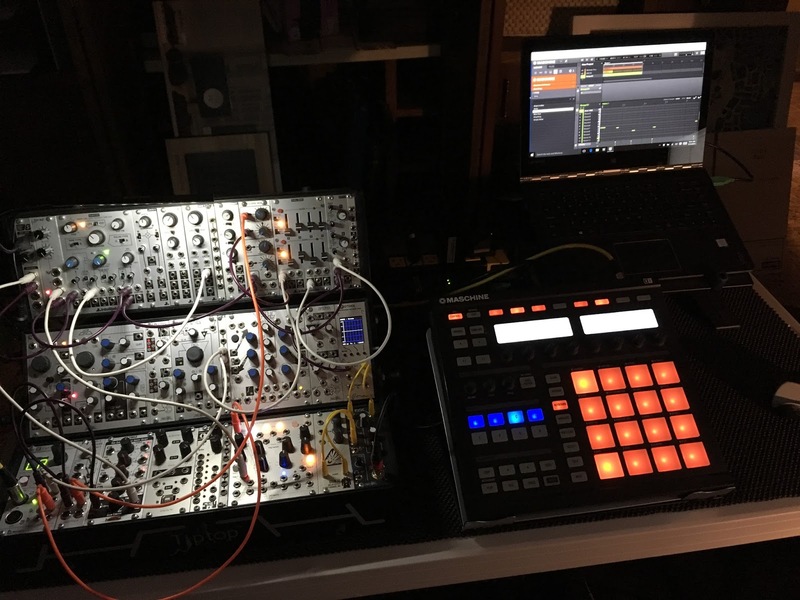 I ended up pairing my Maschine (v1) on a Windows box with my modular, and am in the process of adding a few select plug-ins to the Maschine setup to round things out (mainly, a few effects and a polysynth or two). The first thing I had to do was to make a group/sound for the modular to be sequence by - and to be mixed into - the Maschine workflow. This was pretty basic; I just had to make a sound that did MIDI out and audio in, then set up a keyboard layout to suit. Works fine, and the new arpeggiators and scale modes are quite easy to use. But I really depend on one thing in Live that isn't available with Maschine: a tuner. I could use that hardware tuner I wired up a few months ago, but it would be nice if it was built into the system. Luckily, I ran across the MeldaProduction MTuner plug-in. It is part of their MFreeEffectsBundle, and was easy enough to drop into the machine (and not necessarily install a bunch of other goop). Pairing this into the user preset for my modular sound/group and I am set. Similar to my experience working with the Push and Push 2 devices, I have a tendency to write things completely different than I do with a keyboard. Loads of fun, and a neat jumble-up of my system.